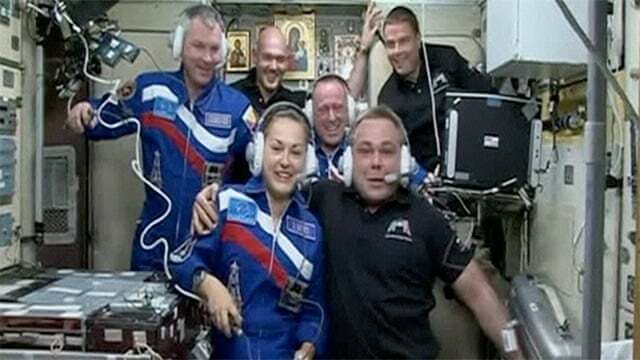 This week, the International Space Station welcomed three new crewmates, NASA astronaut Barry "Butch" Wilmore and Russian cosmonauts Yelena Serova and Alexander Samokutyaev. Their Soyuz space capsule blasted off from the Baikonur Cosmodrome in Kazahkstan last Thursday afternoon, and docked safely at the ISS after a six-hour flight. Regarding the other new crew members, according to NASA, cosmonaut Samokutyaev is currently on his second tour of duty to the ISS, having previously served as a flight engineer on Expedition 27/28 in 2011. Astronaut Wilson is the former pilot of the space shuttle Atlantis, and spent 11 days on the ISS during a mission in 2009. The delivery of the new crew was the second arrival at the ISS last week, as an unmanned SpaceX Dragon cargo capsule successfully docked on Tuesday. The capsule contains, among other things, a special delivery of zebrafish, which will live in the Japanese "Kibo" module's Aquatic Habitat and will be studied for their particular manifestations of muscle atrophy (a major problem in micro-gravity.) Hopefully the research will allow new breakthroughs to be made in counteracting this issue. Other experiments delivered by the Dragon include a Rapid Scatterometer, which examines how winds over the Earth's oceans can affect weather patterns. A delivery of experimental mice were also transported up, along with a habitat and research tools pertinent to the mice-mission. No word has yet been offered on how the mice plan on styling their fur.